It's not difficult to keep fish wet. For the most part, it requires minimal effort to take a knee at the water’s edge, to keep a netted fish in the water, or lean over the side of a boat. These are incredibly simple actions that everyone can choose to do and are easy ways to put conservation into action. Anglers are not part of the problem, they are part of the solution. Anglers — as stewards of our river, lakes, streams, and oceans — have the power, through their photos, to influence how others perceive these ecosystems and conservations efforts. After all, few others have a finger on the pulse of fish populations the way anglers do. As a community, anglers can "move the needle" on what #catchandrelease looks like and improve the outcomes for every fish they encounter. Here’s to your next 1,000 casts, and great photos of the fish that follows! 1) Hold fish over water and not over boats or land. Fish are slippery creatures and can easily be dropped. That way if dropped, it falls back into the water unharmed. 2) Carry pliers, hemos, or some other hook removal device. We know you’re fishing barbless, and a larger size hook should be easy to pluck from a steelhead’s mouth, but something to help remove a deeply taken fly, lure or bait is essential to have on hand. 4) Carefully revive fish: If a fish cannot swim away on it's own it may need reviving. Hold its head facing upstream so that the water runs in the mouth and through the gills. With the fourth or fifth major storm system of 2019 rolling thru northern California, coastal rivers are going big. If you’re a winter steelhead angler you know the morning drill…step 1) coffee, step 2) precipitation forecast and step 3) flow forecasts. But, if you’re on step 3) this morning you know you’re not going fishing this weekend. Well, maybe the X River might, just might, outside chance be in marginal shape, but you know it’s iffy. 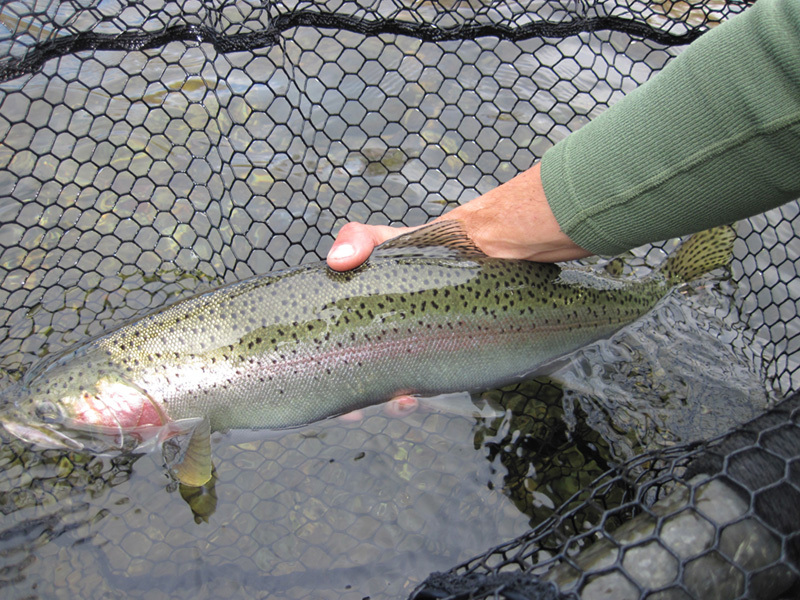 So with winter steelhead on your mind and no fishing to be done, here are some ideas to keep you busy. 2) Swing North - Hidden behind deep gray fog, California’s North Coast is one of the most pristine habitats in the state. But the thick redwood forests and slate green rivers were almost devastated by the impact of industry. Once hosting runs of more than a million salmon and steelhead, the annual fish counts on the Eel River now often number less than 1,000. Yet, the salmonids persist. In recent years, signs of a recovery ripple through the waters. In Swing North, fishermen Mikey Wier and Jason Hartwick hook into the growing population of wild winter run steelhead on the Eel. With appearances by Yvon Chouinard of Patagonia and Shane Anderson, director of Wild Reverence: The Wild Steelheads’ Last Stand, the two discover a river that holds hope for one of California’s great remaining wild fisheries. 3) Wild Reverence - Director Shane Anderson made a pilgrimage to the Olympic Peninsula in Washington state to the rivers he once fished as a boy. 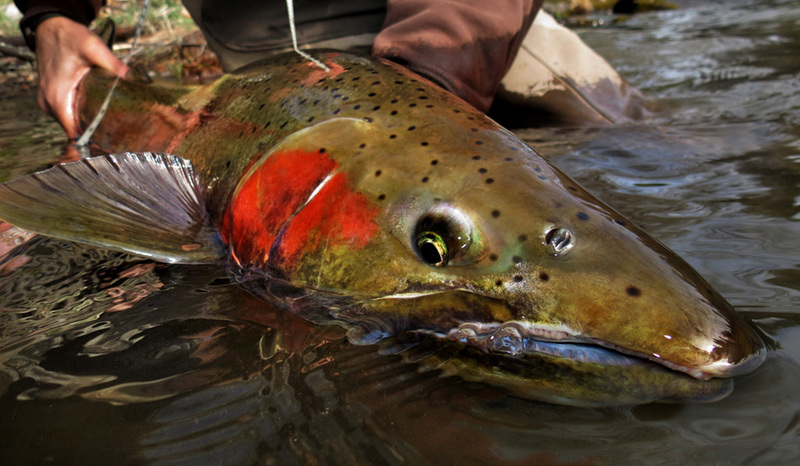 His relationship with the wild steelhead and the rivers in which they met upon taught him just how precious life can be. What was once a childhood fishing trip has evolved into a journey to find answers why his favorite fish is disappearing from the rivers and appearing on the Endangered Species list. How could this wild and beautiful creature slip toward the abyss of extinction? A case can be made that California’s Eel River represents the best opportunity for large-scale wild winter steelhead (and Chinook salmon) recovery on the entire west coast. Once home to an annual return of 1,000,000 wild steelhead and salmon, today a return of 25,000 is considered a banner year with most recent years tallying considerably less. The Eel is a massive watershed with outstanding habitat and one of the few west coast watersheds with no hatchery threatening wild fish genetics. Projects focused on improving estuary habitat, removing numerous fish passage, and addressing large-scale dam removal will take many years, if not decades, and countless millions of dollars…all daunting, but achievable. To learn more about CalTrout’s Eel River efforts within this stakeholder group see their recent film “Return to Abundance”. Anglers overall are a pretty generous group offering both voices in advocacy and financial support to the many conservation organizations fighting the good fight. 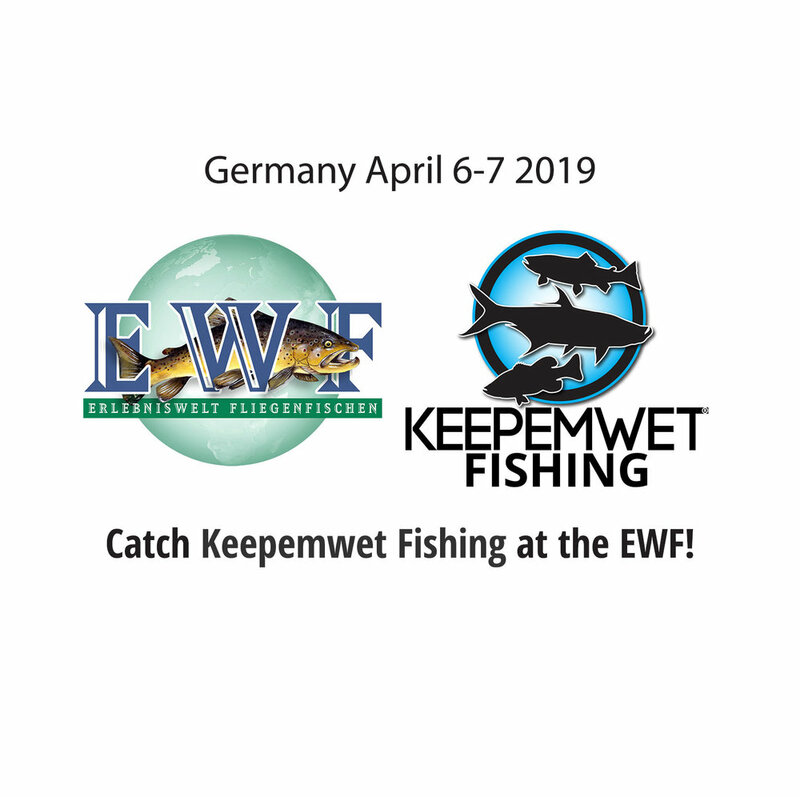 One could argue that as long term conservation efforts play out, the most immediate and meaningful impact conservation minded anglers can have on wild fish recovery is to simply handle fish carefully and respectfully. Keeping fish in the water and eliminating air exposure, not only will help minimize mortality, but limit any potential secondary impacts on spawning effectiveness and fry production. Everything we do today to benefit and protect wild fish can only help future wild fish recovery efforts. Fight ‘em hard, release ‘em fast! Catch and release angling is unquestionably one of the most effective conservation tools in protecting wild fish regardless of species. Over the last few weeks we’ve posted links to a few scientific studies that indicate keeping fish wet and eliminating air exposure helps minimize both fish mortality and potential sub-lethal effects including spawning effectiveness. There are a couple of practices that are particularly relevant when fishing for wild winter steelhead. •	Reduce Angling Duration: Play fish quickly without playing it to exhaustion. You’ll be in a better position to achieve that by matching your tackle to the targeted species. A single-handed 8-weight or a double-handed 7-weight would be a good place to start. These rods will give you better leverage especially when matched with at least 12 pound tippet although 15 or even 20 pound is preferable. •	Fish Barbless Hooks: They cause less damage, are easier to remove, and minimize handling time. Of course, we all fish barbless hooks, but every now and then we get caught up in the excitement and forget to pinch down a barb. •	Photograph Wet Fish: Ideally you keep the fish fully submerged. If not, keep it partially submerged or as close to the water as possible. Fully submerge a fish between pictures. Make the entire process short, and release the fish quickly. 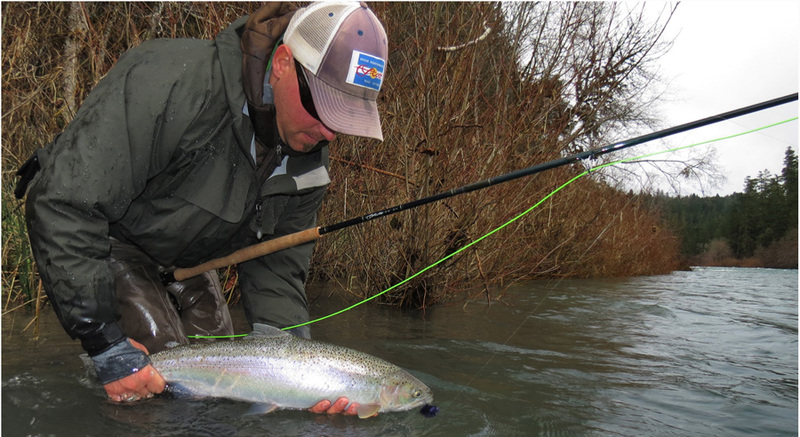 With January approaching California anglers in search of winter steelhead begin to pay close attention to river flow and rain forecasts…all in search of the perfect window of opportunity. And, while we hope you have a chance to come tight to a fresh chromer, we also hope you’ll handle your catch carefully. 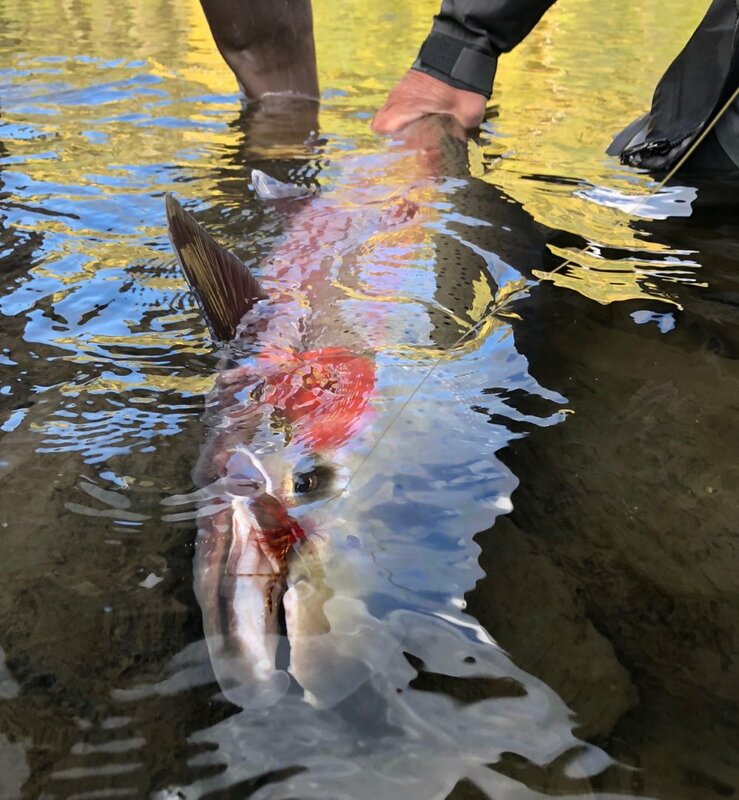 Last week we shared some basic scientific evidence pointing out the short term mortality rates associated with catch and release (CR) steelhead angling using bait, lures and flies. Most of the early catch and release research focused on mortality, but recent research has begun to focus on the “sublethal” impacts of catch and release. 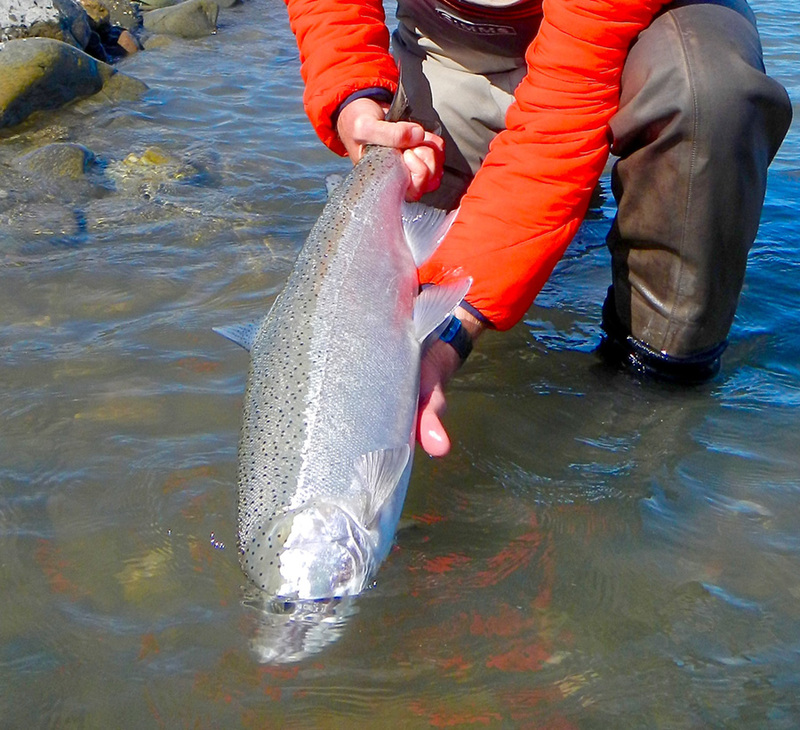 While that research is not specifically focused on steelhead, the evidence gathered on other salmonid species like Atlantic salmon makes many of us wonder about a similar impact on steelhead. •	CR salmon spawn at a rate similar to non-angled fish. •	Larger CR fish (over 31 inches) produced significantly fewer fry than same size non-angled fish. The same was not observed in smaller fish. •	Reproductive success as measured by the number of fry produced for fish kept in the water can be 2-3X greater than fish held out of water and varies with water temperature. Again, it’s important to recognize that genetic and regional differences between species caution us in applying these findings to other species. That being said, it does make many of us think about minimizing fight times and keeping fish in the water.